10" tapered elastic back panel with four anti-roll stays. Side panels with hook & loop closure taper to 6" at the front. 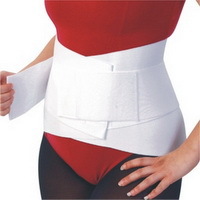 4" tension straps overlap at the abdomen providing additional support.